Reservations canceled within 60 days of the scheduled arrival date are subject to a 50% penalty. 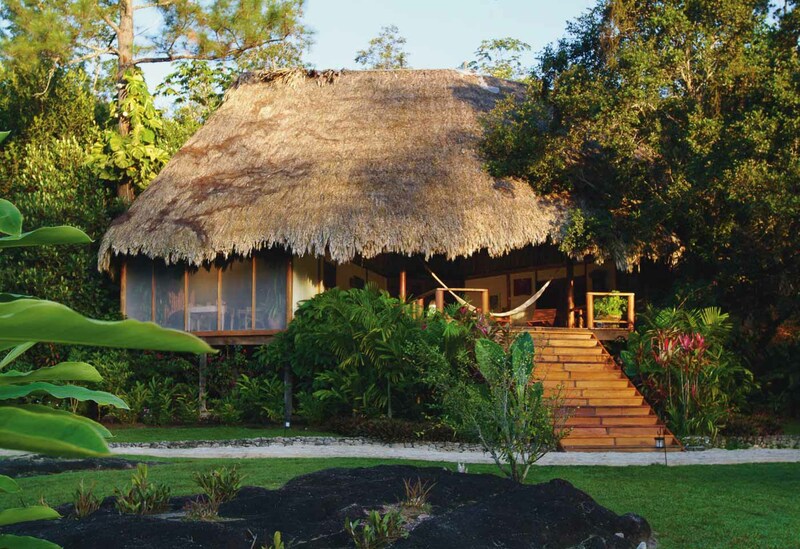 Blancaneaux Lodge is a luxury resort hotel in Belize located in the northwest corner of the 107,000-acre Mountain Pine Ridge Forest Reserve in western Belize’s Cayo District. The lodge itself is nestled on the bank of Privassion Creek and is set among tropical pines, oaks, palmetto, craboo and ancient melastome shrubs. Within a couple of miles of the lodge lie the steep limestone hills and valleys of the 13,000-acre Noj Kaax Meen Elijio Panti National Park. The dense jungle, steep ravines, spectacular waterfalls and fast flowing rivers are uninhabited and home to many rare or endangered species of flora and fauna. Beyond the Mountain Pine Ridge lies the vast uninhabited network of 14 protected areas that comprise the 1.2 million-acre Maya Mountain Massif. Less than an hour drive along dirt roads to Guacamallo Bridge, the granite bedrock and red soils of the Mountain Pine Ridge meet the karst limestone and moist tropical broadleaf forests of the 264,000-acre Chiquibul National Park and the Caracol Archaeological Reserve. Nestled in the hills above the Privassion Creek, the mountain retreat of Blancaneaux Lodge offers the comfort of spacious villas or cozy cabanas opposite the spectacular Privassion Creek waterfall. All dwellings include an alarm, ceiling fans, minibar (stocked with water, wine, soft drinks, Belikin beer and local snacks), organic, locally sourced, handmade soaps, copy of Zoetrope: All-Story Magazine, an iPod docking station and coffeemaker and tea making supplies, among other things. There is no air conditioning; instead there are ceiling fans in every dwelling. Extra nights can be added to your standard package. Tours are generally public, allowing us to offer tours at value. Private tours are available by request, and a surcharge may apply. Transfers are normally quoted on a private basis for one to four persons.